New Delhi: Reiterating the earlier stand of the Medical Council of India which specified that only qualified medical practitioners can sign lab reports, the Delhi High Court recently dismissed a petition filed by the Association of Clinical Biochemists and Microbiologists, challenging the said rule. It is reported that a petition was filed by the said association, challenging the recent dictum was the Medical Council of India that it had communicated to the NABL – “all lab reports to be signed/countersigned by persons registered with MCI/State Medical Council.” In its petition, the association stated that said impugned communication is without jurisdiction and contrary to Section 15(2) of the Indian Medical Council Act, 1956 (hereafter ‘IMC Act’), further contending that it deprives members of the petitioner association of their valuable right to conduct their trade and profession. qualified and it is not necessary that the test report submitted by them be countersigned by a medical practitioner whose name is entered in the medical register. The counsel for the MCI argued that the Indian Medical Council Act which expressly provides that no person other than a medical practitioner would be entitled to sign or authenticate a medical or fitness certificate or any other certificate required by law to be signed or authenticated by a duly qualified medical practitioner. He submitted that the members of the petitioner association were not entitled to sign any medical fitness certificate and a pathology report would fall within the scope of a medical certificate if there is any expression of opinion and/or indicative diagnosis. He submitted that it is in this context that MCI had issued the impugned communication insisting that a pathology report be countersigned by a medical practitioner. it is apparent from the above that no person other than a duly qualified medical practitioner is entitled to sign any medical report. Thus, members of petitioner association cannot sign a medical report or a medical certificate. However, the same does not preclude the members of the petitioner association to give a technical report as to the tests conducted by them. Plainly, such report can only be for consumption of medical practitioners and pathologists. 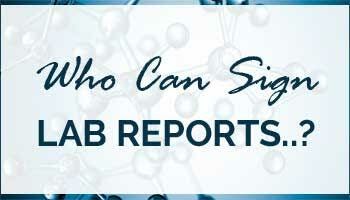 The said report cannot be treated as a diagnosis of any medical condition. Thus, there can be no objection if the technical report submitted by the qualified technicians indicates the result of their tests or the technical analysis of the samples, as long as the members of the petitioner association refrain from expressing any medical opinion or holding out the technical result of the medical tests conducted by them as a diagnosis of any medical condition. This Court is also of the view that although members of the petitioner association are not precluded from acting as a laboratory technicians and submitting the result of tests conducted by them, adequate safeguard must be maintained to ensure that the reports submitted by them are not mistaken as medical certificates or diagnostic reports as that would, concededly, violate Section 15(2)(d) of the IMC Act, 1956. Thus, it would be apposite that all test reports must necessarily bear a disclaimer to the effect that the report are strictly for the use of medical practitioners and pathologists and the reports are not medical diagnostic results. Any pathological report which purports to record any opinion or to indicate any diagnosis must necessarily be co-signed by a qualified medical practitioner. Great decision. In various institutions world over, PhD qualified people have subjugated medical doctors to lot of exploitation by working in gangs and are known for high handed ends of highly qualified Medical doctors.. This is a great decision by the honorable high court.Atleast in India we would see that no more. It reemphasizes the fact for this relatively less qualified community that..with less qualification you get limited responsibility. Medical Doctors please wake up for your rights!!. For the author of this article..please remeber a Msc or PhD in biochem or Micro are not Clinical Biochemists or Clinical Microbiologists. People have worked hard to become medical doctors, let\’s respect their hardwork and qualification!! Highly qualified superspeciality doctors don\’t bother about new rules. All are having economic interest. When previous rules were there before 1998 , doctors in India were respected like god but now doctors degraded themself to that extent that common people gets satisfaction by slapping & kicking doctors. For this difference in outlook of a profession with in 20 years is a very hard work by MCI. I feel that it should be mandatory to verify all diagnostic results by a technical person who perform the test by himself or supervise the same. He understands the technicality and QA side of the test which a clinical doctor may not be familiar with. This will ensure the MSCs and MLTs have a critical role to play in healthcare delivery. The MD doctors will understand the clinical aspect of the test and can very well correlate the results clinically and can also discuss with the clinicians in case the results are not as expected . Hence the results which are reviewed by MSCs has to be signed by MDs . If we can make both the steps and accreditation mandatory then the healthcare delivery will improve and a long lasting battle between medical and non medical will come to an end as both are critical for a better patient out come. Thanks for understanding the role of technician. All qualified technicians having same responsibility as doctors. As of we are working with pathologist almost 99 to 100 % work done by technician and the doctors are only approving reports. it means the technicians are doing our job. there are thousands of laboratories are providing services in india but there are finger countable pathologist available all over, it does not mean to close all labs. Instead of all reports only selected reports like histopathology, cytology or peripheral smear report should be signed by pathologist. now consider if same holds true for Xrays/CTS/MRIs.. let the technicians just conduct the tests.no reports! Microbilogists and pathologists were not expressive enough about their rights!! Dear Abhijit, I feel 158189 clearly states that the test report should be unbiased, but the way you are saying, a clinician would know better to decide on the report based on the patient condition. Does this mean that if a lab test contradicts the clinical finding, the clinician can modify the lab report to get it in compliance with clinical condition? Doesn\’t that become a biased reporting and contradicting ISO15189. Clinical correlation using text book is the accepted practice. Tietz is one of the best books. This book is written by Dr. Carl A Burtis, who in 1976 joined CDC to bring out reference ranges for clinical tests. based on his findings the book was compiled. Oh yes, Dr. Burtis is a PhD and a so called Non-medico. Would you like to reconsider using Tietz as a reference book now? Dear Siva, 31 out of 50 author of Tietz are PhDs. So is the case of many other reference books of Biochemistry. In past 10 years, more than 95% of the Noble laureates in medicine are PhDs not MDs. Thanks god this all does not come under the preview of Mad Council of India. MD in pre and para clinical subjects have been started only few decades back. And we know it very well who all MBBS people adopt these streams. These people and their forefathers have been taught by PhDs. But these insecure people will not acknowledge these facts. They are doing to us what clinical stream people do to them. And finally let me point it out , the super speciality subjects like nephro, cardio, neurosurgery, urology etc were initially taught by post graduate teaches in medicine or surgery who have worked in such areas, now it is taught by specialists, so this is evolution its normal, why create a fuss, possibly in coming years also lab medicine will inly be taught by MD people.